The New Order doesn't believe in the word "never". At least, not when carebears use it. For instance, "I'll never pay you. I'll never buy a permit. I'll never obey the Code." 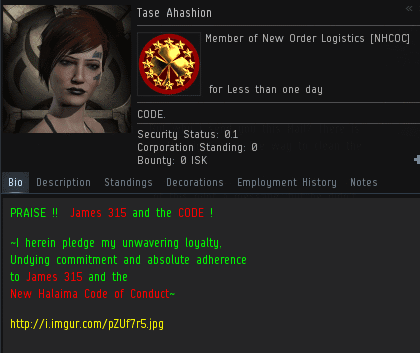 Tase Ahashion was one of the more passionate opponents of the Code. 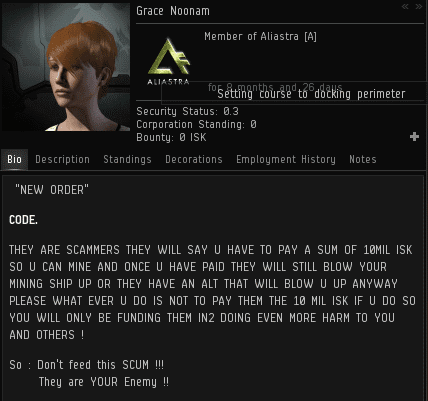 A freighter pilot who lacked a permit, Tase suffered the obvious consequences and threatened to petition CCP. He continued to campaign against the Code, insisting that ganking is not allowed under the EULA. Finally, after his corporation dissolved due to New Order wardecs, he felt he had no choice but to buy a permit. But the New Order sees and hears everything. It didn't take long for Agent loyalanon to learn of Tase's ulterior motives for buying a permit. Under interrogation (but not torture), Tase confessed that he didn't really believe in the Code at all! Then came the twist: As bad an EVE player as Tase was, as much of a bot-aspirant he was, and as much time as he wasted with frivolous petitions, it was not loyalanon's wish that Tase Ahashion leave the game. Despite the fact that Tase represented everything wrong with highsec carebears, loyalanon didn't want to run him out of the game. loyalanon wanted to help him. 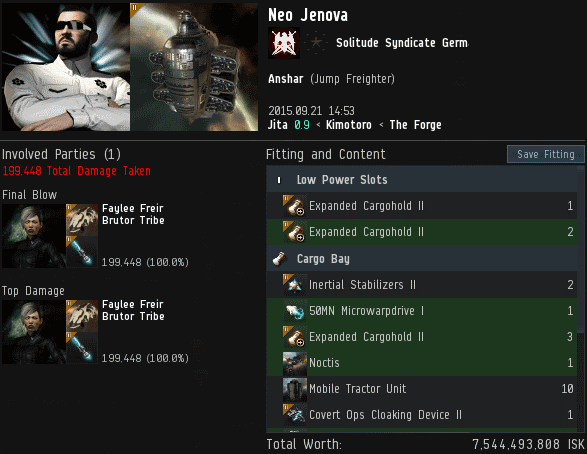 The New Order's generosity and benevolence is unmatched in EVE. No other organization spends so much of its time helping and reaching out to its avowed enemies. loyalanon offered to share the secrets of a positive EVE experience with Tase. Though initially skeptical of the idea, Tase agreed to be taken under loyalanon's wing. But first, the bot-aspirant needed to cut ties with his old life. Taking a vow of poverty, Tase contracted his assets, including his cherished freighter and Orca, directly to loyalanon. Next, Tase was trained in the art of the gank. He even joined some freighter ganking fleets. From freighter pilot to freighter-ganker; it was a wondrous transformation. 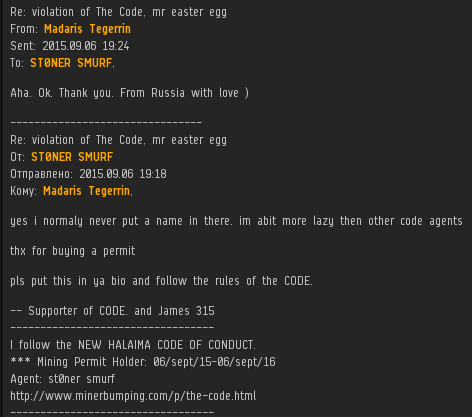 The carebear who had petitioned CCP so many times was now a member of CODEdot, the very alliance he'd insisted was violating the EULA. Tase briefly popped up on the MinerBumping forum, expressing enthusiasm for his new EVE career and the Saviour who made it all possible. It was the golden age of Tase Ahashion. Alas, it was a false dawn for Tase. During one of the freighter ganks, he shot the freighter wreck, potentially costing the fleet its precious loot. Tase was kicked from the fleet. Now Tase no longer believed he had a chance in CODEdot. He had ruined it, just like he'd ruined everything else in his EVE career. Tase Ahashion > No they wont, that much has been made obvious already, they resent me for some reason. loyalanon urged the reformed carebear not to quit. 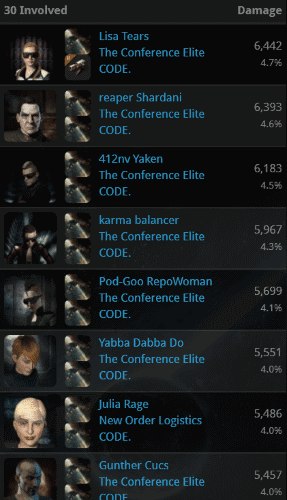 When loyalanon said every EVE player counted, he'd meant it. Others may have dismissed Tase, but loyalanon truly wanted to see him succeed. loyalanon > let me know if you decide to stay. Tase Ahashion > Thank you for everything, it was fun while it lasted. Besides I am now flat broke. Cant even buy a shuittle, LOL. I wish you all the best and please continue enjoying eve. Tase Ahashion > I will not be staying. Good bye my friend. New Order Agents rallied behind Tase, but he was not cut out to be an elite PvP'er. At least, not yet. Tase took a break from EVE but eventually returned. He deleted his bio and joined up with PvE'ers, sliding back into his old carebear habits. The truth is, there is no going back. 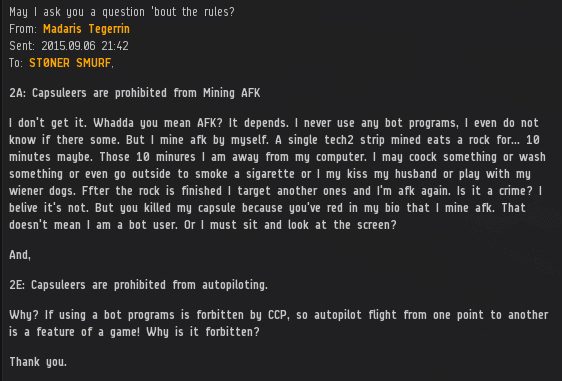 Tase's dream of bot-aspirant gameplay died when the Code was written--even if he didn't know it yet. One day, Tase will return to the New Order family. 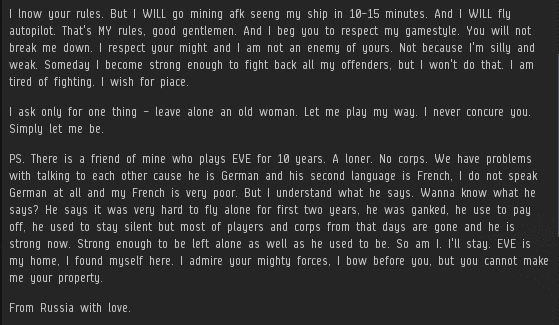 If he is to have a future in EVE, there is no other choice. "Aaaarrgg!" bellows the miner. "Aaaarrgg!" screams the autopiloter. Is it a guttural expression of rage, or is it something... more? 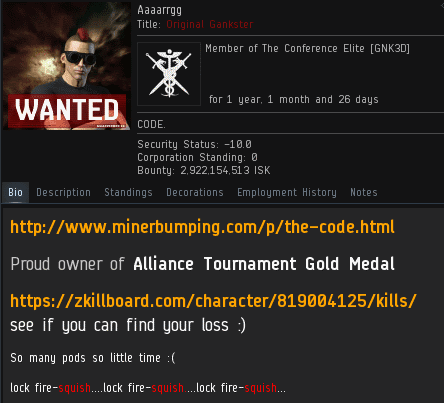 Agent Aaaarrgg is one of highsec's finest. Like so many of our Agents, he has gracefully made the transition from normal player to EVE celebrity. He takes joy in elite PvP of all kinds, but specializes in destroying unlicensed autopiloters' pods. No one seriously doubts Aaaarrgg's elite status and the elite nature of his PvP. To do so would be to ignore the very laws of mathematics and logic upon which an advanced society is built. As Aaaarrgg was surveying the highsec he helped to create, he browsed some of his old EVEmails. Many of our Agents receive correspondence from their sparring partners. 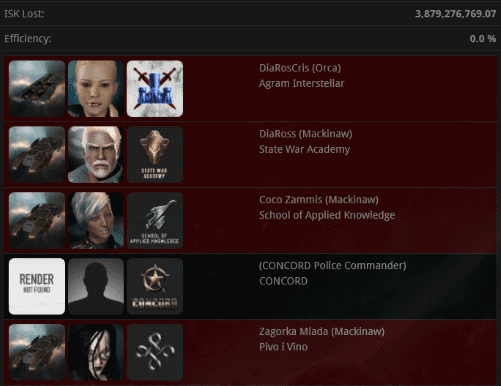 Often, EVE players enjoy PvP'ing with our Agents so much that they yearn for a rematch. Then there are those who simply wish that "someone else" would defeat Aaaarrgg. For whatever reason, not everyone appreciates the skill of the pod-killers. They instead admire those who F1 a broadcasted target along with 500 of their closest friends, or people who assign drones, or provide links, or whatever else nullsec cooks up. We in highsec know better. Well, most of us. 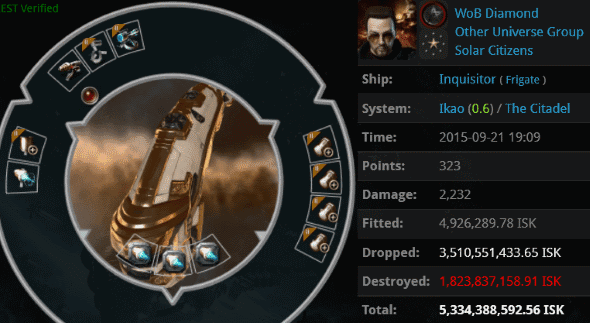 Atonepoint had a good attitude about his pod loss, but also displayed a troubling ignorance of EVE game mechanics. New Order Agents build bridges and tear down cultural barriers. Our Agents receive feedback from EVE players all around the world. Sexual contact with Agents' family members is a common theme among those who write post-battle EVEmails to our Agents. Most likely this is a reflection of the age-old practice of ambitious men and women marrying into power. However, the New Order rejects the dynastic conventions of the past. Ours is a purely merit-based system. We promote the elite PvP'ers. The transformative nature of our mission inspires hope, but also dread. Instinctively, the bot-aspirant carebear fears falling behind in a changing world. If he refuses to embrace the Code, he should be afraid. But the wise highsec PvE'er looks at someone like Agent Aaaarrgg and says to himself, "That's who I want to be. That's who I want to raise my children to be." Carebear, is your pod safe today? I get a lot of random EVEmails from people all across highsec. Whenever I see a message like this plea from Madaris Tegerrin, I become curious about the events that led to its being written. Every EVEmail has a story. This is one of them. It began harmlessly enough. Agent ST0NER SMURF ganked an empty pod belonging to a carebear. He then sent her a standard-issue New Order information packet containing some background about highsec history, along with a survey. Madaris was impressed enough to respond with a payment of 10 million isk. 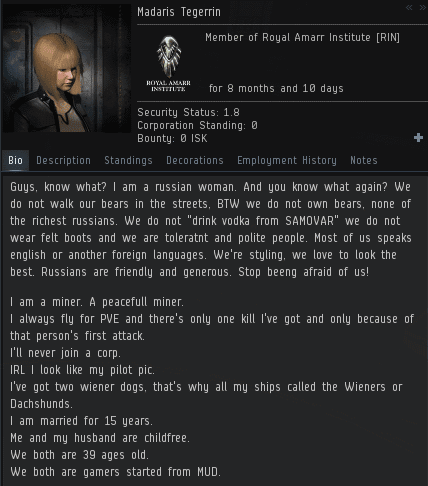 She also added a mining permit to her bio. So far, so good. ...But then things went awry. Instead of accepting the Code without reservations, the miner began to think for herself. Unfortunately, this often leads to Code violations. Agent ST0NER warned her against this. Madaris had some serious concerns regarding the provisions in the Code about AFK mining. It seems she'd developed a taste for AFK mining over the previous several months. A Gallant miner would have changed her behavior. Madaris, on the other hand, wrote an essay. Like so many other AFK miners, Madaris felt it was her right to engage in automated gameplay. She wanted to be exempt from the Code because she walks with a limp. You might ask how that prevents her from docking up before going AFK--or indeed, how it affects her gameplay in any way. Carebear excuses rarely make sense. And they never take priority over the Code. Madaris declared her intention to violate the Code on a regular basis. She wanted to play by her own rules, because she is "an old woman". However, the Code does not allow for such biases. It embraces diversity: Everyone gets to obey. Agent ST0NER answered Madaris' questions. She had asked how Agents determine if a miner is AFK; he told her that miners must respond in local if requested by an Agent. To put it mildly, Madaris didn't like that answer. She immediately removed the mining permit from her bio and wrote another essay. Madaris simply couldn't accept the idea that miners must take their place at the bottom of the highsec hierarchy. Nor would she recognize the exalted position of our Agents. Let a miner speak for long enough, and he'll almost always admit his guilt. 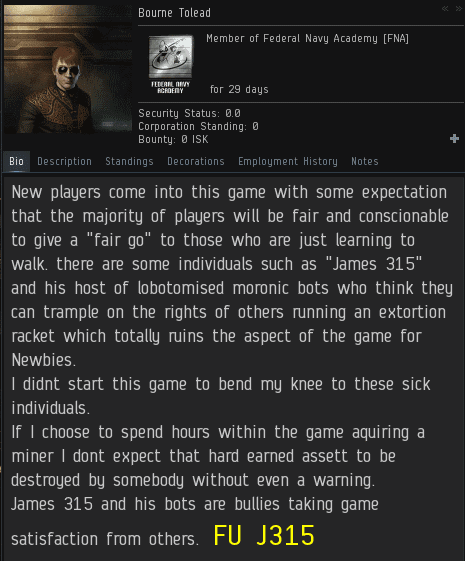 Madaris expressed illegal opinions about highsec's Saviour, but there was more: She admitted that she "started to play EVE because of its AFK possibilities"! CCP marketing team, take note. Interestingly, she also revealed (if you didn't catch it in her bio earlier) that she was 39 years old, which qualifies as "an old woman" by her standards. Were you imagining an elderly grandmother with her cane, dear reader? Never trust a carebear. Madaris gave up her mining permit. Without a valid New Order license in her possession, the carebear was left with nothing. Nothing, that is, except her appreciation of the wondrous beauty of EVE. Nevertheless, it is the Agents of the New Order who make EVE beautiful. Carebear, don't spoil it with your non-compliance. The New Order and the Ministry of Love joined forces to attack bot-aspirant freighters in highsec this week. Whether to remember our martyrs, or to protest FozzieSov, or out of simple love for the Code, freighter ganking is always a good idea. Half a dozen jump freighters and 60+ freighters died during the week of September 20th @ 00:00 EVEtime through September 26th @ 23:59 EVEtime. At this point, carebears must be running out of excuses for falling victim to such campaigns. Permits serve as a litmus test of one's character in so many ways. 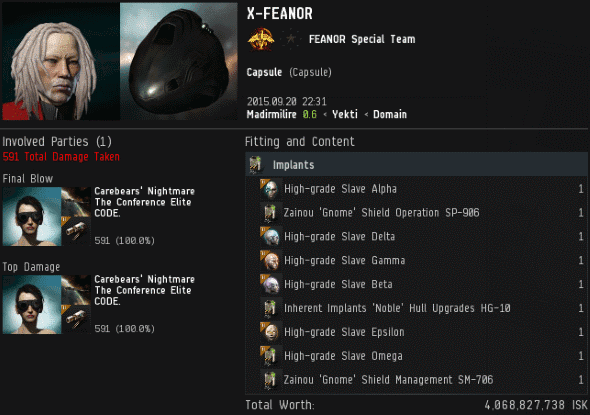 Ian Noonam put everything into his freighter, inflating the ship into a prize worth 19.3 billion isk. The next step in his master plan? Autopiloting through the Uedama corridor while it was being camped to death by freighter gankers. Ian's alt updated her bio soon afterward. 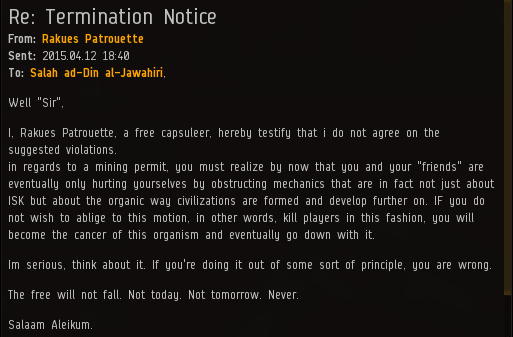 Frankly, I'm not so sure people who lose a 19.3 billion isk freighter are in a good position to offer advice to their fellow highsec dwellers. Especially advice like, "Don't waste 10 million isk!" Agents Spine Ripper, karma balancer, Lisa Tears, Krominal, Nitetime Video, holdmybeer, Yabba Dabba Do, Keraina Talie-Kuo, RAGE QUIT, Zula Terra, Aaaarrgg, loyalanon, reaper Shardani, 412nv Yaken, ThatOleSerpent, Winnie Po0h, Sophia Soprano, Chocolate Mooses, Yasu Abraham, Pod-Goo RepoWoman, Karmafleet Is Recruiting, TheInternet TweepsOnline TheInternet, KBKspawnwrath666, V-ktor Dolus, and Dewzer Eyre executed the gank. Ask them for advice. 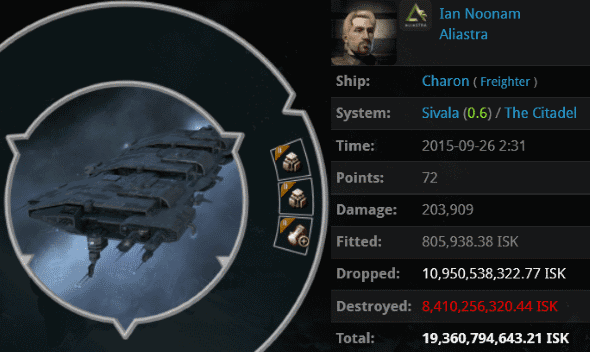 A gank fleet comprised of 29 Atrons performed this kill. Why do something like this? To glorify the Code. It's like, living artwork or whatever. Kudos to Agents Lisa Tears, reaper Shardani, 412nv Yaken, karma balancer, Pod-Goo RepoWoman, Yabba Dabba Do, Julia Rage, Gunther Cucs, Keraina Talie-Kuo, Aaaarrgg, Winnie Po0h, Krominal, Tetsuigablm, loyalanon, Dewzer Eyre, Yasu Abraham, PV Rock, Lady Ati, ThatOleSerpent, V-ktor Dolus, Spine Ripper, Moogular, TheInternet TweepsOnline TheInternet, Chocolate Mooses, holdmybeer, RAGE QUIT, Karmafleet Is Recruiting, CatanaFleet Red, Admiral Deka, and Free Massages. I recommend sending your petitions to a ganking expert. Look for the devs with mining permits. She was so furious that she immediately opened fire with her three Mackinaws' attack drones, getting all of them CONCORDed in the process. Who says a mining ship can't shoot back? 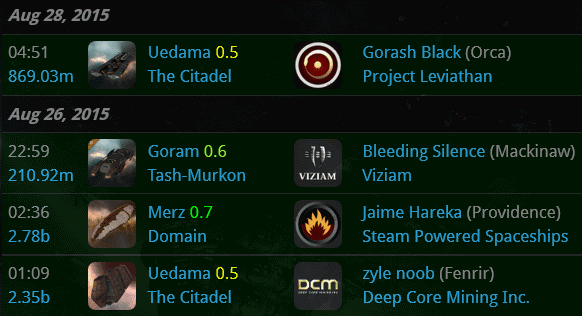 WoB Diamond made his triumphant return to the Kills of the Week, having been absent since last year's 5 billion isk autopiloting Nightmare. Agents Salah ad-Din al-Jawahiri and Get Well Soon spotted WoB's suspicious-looking frigate traveling through the Uedama corridor without a permit. To be sure, it was fail-fit. 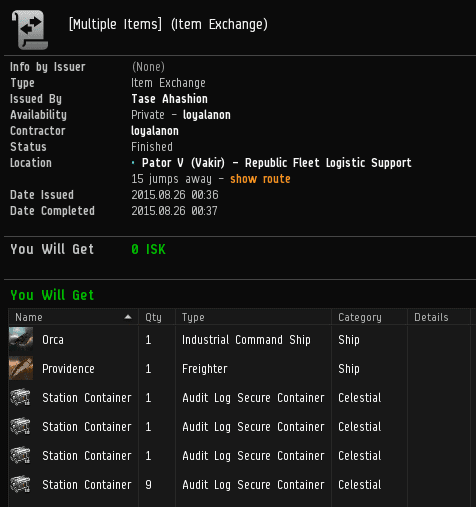 It was also fail-cargo'ed, with 5.3 billion isk in contraband. Back to square one for WoB. X-FEANOR is a familiar presence on any high-value kills list. 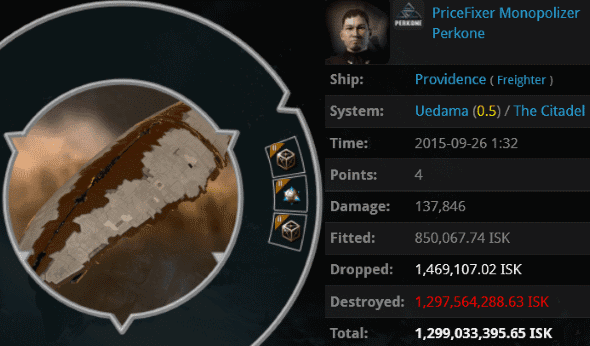 This week, his expensive freighter was just one among many, but his 4.4 billion isk pod (as valued by zKillboard) couldn't be ignored. Agent Carebears' Nightmare had the honour of adding to the X-FEANOR legacy. ...you know it's about time for the next edition of the Highsec Miner Grab Bag. Agent V-ktor Dolus has discovered evidence of a new form of bot-aspirancy: Carebears who don't bother to anchor their ship assembly array inside the POS shields! Unfortunately, the carebear couldn't get past the first question. 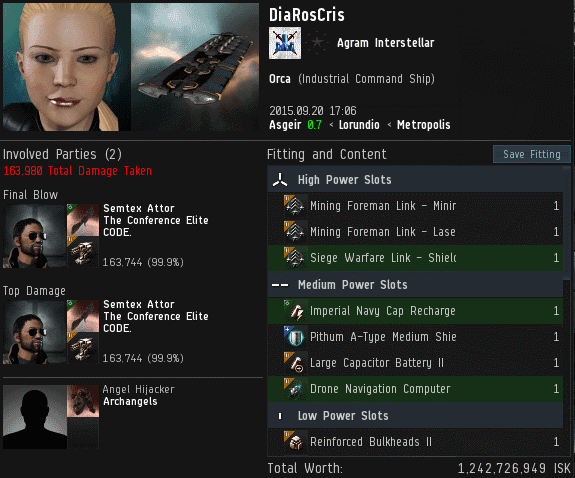 A miner joined Agent Liek DarZ's fleet expecting Orca bonuses and such. She joined the wrong fleet, I think. Or maybe she joined the right fleet--she was soon ganked by our Agent, which was precisely what she deserved. There's a reason why most surveys have a section for "Don't Know/No Opinion". This carebear would be heartbroken to know that CCP devs are given laminated mining permits at fan events. Ah denialists. For a Code that doesn't exist, it certainly has a lot of influence these days. To be fair, our Agents usually don't buy ships with their mothers' RL money. We have X-FEANOR's RL money for that. I think Rakues Patrouette is confused about the way civilizations develop. I'm not sure why; it's explained right at the beginning of the Code! Luckily, the carebear promised not to get mad. Although I get a fair number of angry EVEmails, I also receive a lot of random requests for forgiveness. Highsec miners must perceive that I am a very forgiving person. Impressively, most apologies I receive are sincere, and not of the political, conditional "If I offended you, then I apologize" variety. Their sincerity is rewarded. I'm always willing to forgive EVE players who are willing to make up for their crimes.